In the heart of Hamilton’s east end, a new kind of mining operation is running full tilt. They’re not searching for gold, silver or any kind of precious metals. They’re mining cryptocurrency — an enigmatic digital currency that is prone to massive swings on the world’s financial markets. Cryptocurrencies like bitcoin and litecoin have drawn interest and ire the world over, and now, a company called CryptoGlobal is betting big on them. “The markets will be volatile no doubt, but we are big believers that there is a space for crypto in the financial markets of the future,” said Rob Segal, Cryptoglobal CEO. From the outside, the company’s building looks unassuming. But as soon as you step inside, a wall of heat slams into you. Then comes the noise — the sound of hundreds of fans, trying to control the extreme temperature being thrown off by rows and rows of powerful computers sitting on utilitarian warehouse shelving, all working overtime. Segal says there are 5,000 machines running at their facility, which began setting up back in December. By April, they expect to have 10,000 machines fully operational. Right now, they’re sitting in a building the size of a typical retail big box store, whirring away. Why is the “mining” operation here? How coins are created, how transactions are authenticated and how the whole system manages to power forward with no central bank, no financial regulator and a user base of wily computer users all comes down to computing power and technical wizardry. The tally, or “block chain” is one of the most important ways in which these currency systems prevent fraud. Miners are then in turn rewarded for supporting the system. 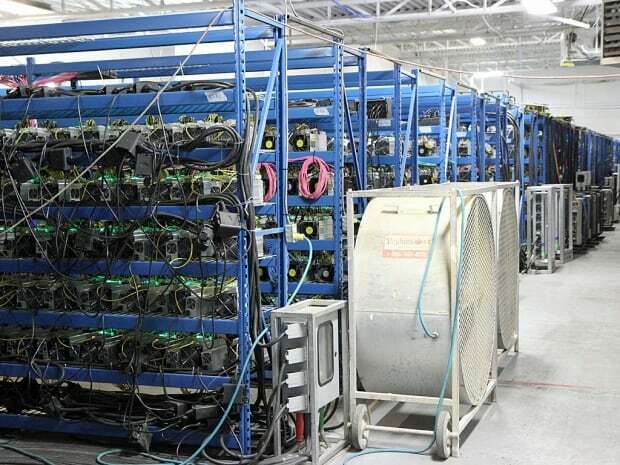 Bitcoin is generated by thousands of these so-called miners. 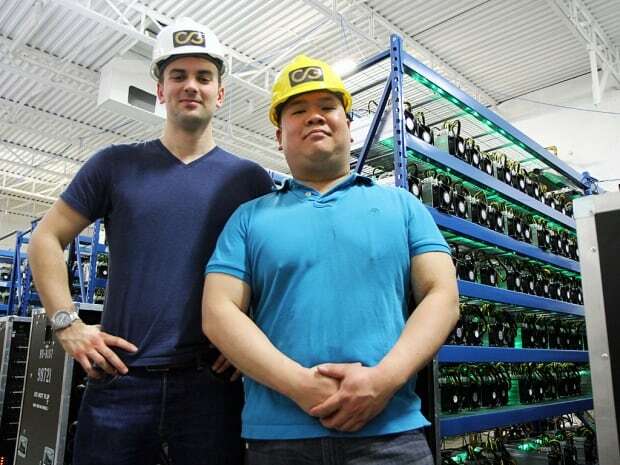 These are people who, working individually or in groups called “mining pools,” (like this one) use powerful computer components to run software that solves a series of mathematical puzzles. Each time the miner solves the puzzle, they receive bitcoins or other currency, which they can trade for physical currency or otherwise put into circulation. So why should they get money for doing this? The argument is that these users essentially become a decentralized version of the Bank of Canada. 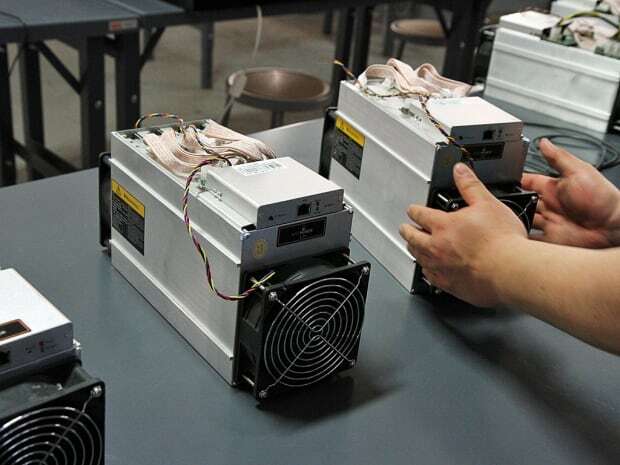 They invest their own time and resources — like electricity and computing power — and in turn, the bitcoin network is supplied with the processing power needed to maintain a transparent, running tally of all transactions. A similar process applies to all alternative digital currency. But it’s not a terribly stable market. Cryptocurrency values plunged last week, with bitcoin at one point sliding below $8,000 US, which marked its biggest weekly loss since Dec. 2013. This slump brought the total market value of cryptocurrencies down to around $400 billion US, half the high it reached in January, according to industry tracker Coinmarketcap.com. The market value of cryptocurrencies is calculated by multiplying the number of digital coins in existence by their price, although many question whether that is the right way to value them. Last week, India vowed to eradicate the use of crypto-assets, joining China and South Korea in promising to ban parts of the nascent market where prices have boomed in recent years. Facebook said last week it would ban cryptocurrency advertisements because many were associated with misleading or deceptive promotional practices. U.S. regulators also sent a subpoena to two of the world’s biggest cryptocurrency players, Bitfinex and Tether. A massive $530 million hack of a Japanese cryptocurrency exchange late last month renewed worries about the security of the industry. “I think it will find some stability in the coming months or year,” he said. In the meantime, Cryptoglobal plans to keep scaling up in Hamilton. The post Step inside Hamilton’s massive Cryptocurrency Mining Lab – Hamilton appeared first on WorldFeed.co.